SNCC members viewed gaining the right to vote as a significant move towards racial equality in the South. If blacks had the power of the vote, SNCC felt they would have influence over many important aspects of southern politics. SNCC organized the Freedom Ballot in the fall of 1963 in the state of Mississippi, where racial discrimination was the strongest and black voting power was the weakest. The Freedom Ballot was a mock election to get the vote for poor southern blacks. The campaign was a statewide attempt to demonstrate the discrimination poor blacks faced in politics. 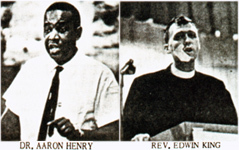 There were two volunteer candidates, Aaron Henry, a black NAACP leader from Clarksdale, and Edwin King, a white man well known in the state for his active involvement in the civil rights movement. The Freedom Ballot platform called for an end to segregation, fair employment, better schools and a guaranteed right to vote. Students from Stanford and Yale came to work on the Freedom Ballot, joining forty SNCC members. Many of the white northern students were attacked and beaten by Mississippi whites, calling them "outside agitators." Despite some arrests of campaign workers and protests of whites, the Freedom Ballot was a success. Nearly 80,000 blacks came out to vote, four times the number of blacks registered to vote in the state. Bob Moses said that the Freedom Ballot had shown what SNCC had hoped it would show, that Blacks would vote if given the opportunity.